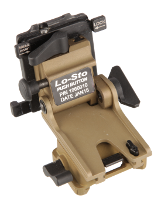 The most lightweight and compact helmet mount solution on the market provides optimal performance alongside rugged durability permitting continual performance in most adverse conditions, with Push Button Stow Release. The Universal Shroud-Light accelerates previous expectations of the possible delivering an optically aligned light integrated into the shroud, where user head movements guide the direction of the available red, white, or blue beams. 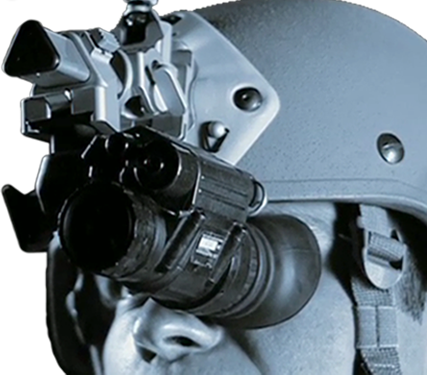 Committed to continuous advancement of product development providing for the ever-changing night vision demands of our military, Norotos places a firm devotion to workmanship, credibility, and passion. A steadfast allegiance to our core values guide our every operation from quality precision manufacturing to harmonious research and design. 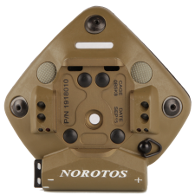 A firm dedication to Anti-Wobble Optimization provides one of the foundational values for Norotos' design and manufacture of night vision helmet mounts, shrouds, and accessories. Anti-Wobble Optimization ensures persistent field use, restraining wobble induced eye-fatigue. Ergonomic enhancements intensify our commitment to extending field use longevity through user-friendly intuitively placed adjustment and release controls. If you have any questions or need more information about our night vision helmet mounts, please contact us using the information below. [email protected] If requesting quote, please include quantity and goggle type. Night Vision, Night Vision Helmet Mount and Helmet Shroud website copyright © 2005-2019 Norotos, Inc. All rights reserved.